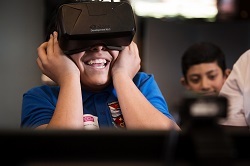 Hundreds of school students and their teachers from across London came to the Emirates Stadium on 1st May for TeenTech City, a lively and immersive event designed to help teenagers see the wide range of career possibilities in Science, Engineering and Technology. From the latest AI to data science in archaeology, from virtual worlds to real world challenges, school students had the chance to meet people working at every level from apprentice to CEO, giving students a real insight into the industries of the future and the skills they need to take advantage of them. An interactive, focused and fun event, the day provided invaluable, hands-on opportunities for young people to explore innovative work from companies, universities and colleges. At Queen Mary, University of London stand, the The Arduinitar - a do-it-yourself electronic guitar based on the Arduino microcontroller board - was a hit with students as they received a 15-minute crush course in analog and digital electronics before wiring the sensors themselves to make the guitars rock! Students also got to compete against each other to create a robot arm that could draw a smile on the robot face, by using: cardboard (for the robot links), toothpicks (for the robot joint), two plastic syringes connected by one tube to make the robot arm to move (by injecting air with one syringe), a marker to be attached to the tip of the robot arm (to draw the smile), plastic ties, scissors and cutter. The challenge was hugely popular with students with many smiling robots created by the end of the day. Queen Mary, University of London was delighted to co-sponsor TeenTech City and support TeenTech in raising student aspirations and awareness of career opportunities in STEM. Other sponsors included City of London, The Bank of England and Connect Wise and the BBC, Microsoft, British Army, Siemens and Bloodhound were among the participating companies and organisations.